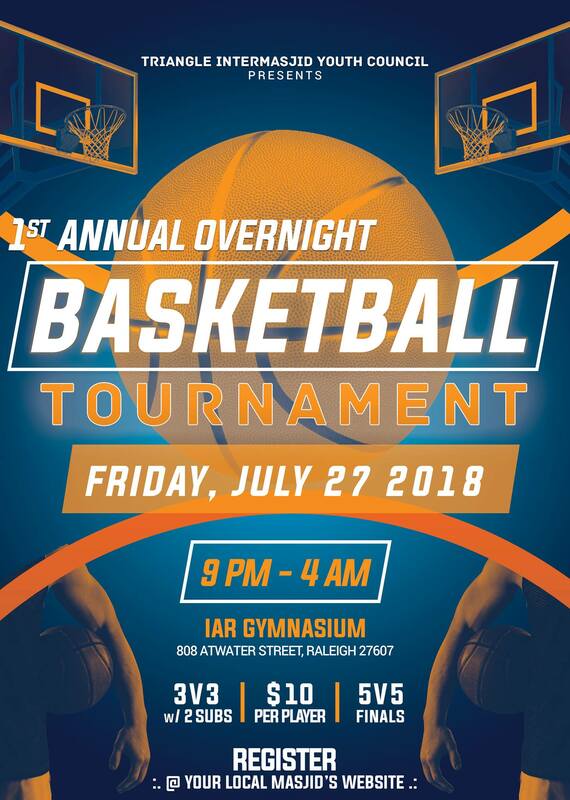 The Triangle InterMasjid Youth Council is hosting their 1st Annual Overnight Basketball Tournament for Grades 8 – 12. The purpose, the only purpose, is to enjoy a competitive game of basketball among our brothers*. There will be food, interim activities and much more. The regular and playoff games will be played half-court with 3v3 and 2 subs each. The final game will be played full court with 5v5 and no subs. Thanks to the reps of (alphabetically): Apex Mosque Youth, Cary Masjid Youth, IAR Youth, ICM Youth, Muslim Youth Community Center, RII Youth. *Though this form is for the brothers tournament, we are encouraging our sisters to please fill this form out as well. If we have enough interest from the sisters, iA we will set one up for sisters only on August 10th iA. Register at your local masjid’s website!